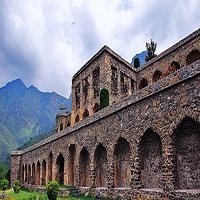 "Pari Mahal or The Angels' Abode is a seven terraced garden located at the top of Zabarwan mountain range over-looking city of Srinagar and south-west of Dal Lake." The architecture depicts an example of Islamic architecture and patronage of art during the reign of the then Mughal Emperor Shah Jahan. It is five-minute drive from Cheshmashahi, Srinagar.The Pari Mahal was built by Mughal Prince Dara Shikoh in the mid-1600s. It served as a library and an abode for him. Dara Shikoh was said to have lived in this area in the years 1640, 1645, and 1654. It was further used as an observatory, useful for teaching astrology and astronomy. The gardens have since become the property of the Srinagar government.